First look at Sinar Hy6 medium format digital camera | Digital Photography. 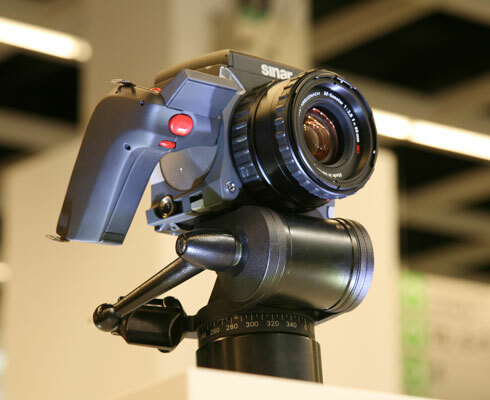 Will the Sinar Hy6 medium format digital camera replace the Hasselblad H3? Rollei (Franke and Heidecke), funded seemingly by Jenoptik (the situation is never clear), has produced two admirable cameras: the Sinar Hy6 and Leaf AFi. I saw the Leaf AFi in the Leaf headquarters in Israel in May. The camera is not manufactured there, only the Leaf Aptus backs. The Rollei Jenoptik Sinar Hy6 I saw at Photokina 2006. Sinar Hy6 medium format digital camera at Photokina 2006 Nicholas Hellmuth evaluating the Synar Hy6 medium format digital camera. There are many reasons to consider the Sinar Hy6 and Leaf AFi rather than the Hasselblad H3DII. And comparing medium format backs with the Canon EOS 1Ds Mark III is like comparing two totally different species. 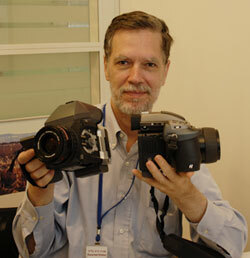 First, Hasselblad was the first camera manufacturer to try to eliminate the other medium format backs. Hasselblad really wants you to use only an Imacon back on a Hasselbald camera. Considering that Phase One is the #1 selling medium format back in the world, you can understand Hasselblad wishing to lock out competing backs. 75s, Leaf Aptus 65s, and Leaf Aptus 54s, similar to Franke & Heidecke (Rollei) and Sinar Hy6 from Jenoptik. But this backfires, since Phase One owners will now look to other camera bodies: Mamiya AFD or older Contex bodies. I simply use my Phase One P25 on an elderly Hasselblad ELX (V-series). I will use my P25+ from Phase One also on an old Hasselblad V-series camera body. But the main reason to look at the Sinar Hy6 is because Jenoptik has more money available for R&D than does Hasselblad. The H1 Hasselblad was designed in the year of decline of medium format, when backs had to be connected with a computer (not very portable). So the Hasselblad had to be made by Fuji, etc. It is not made in Sweden, and the lenses are not from Zeiss. 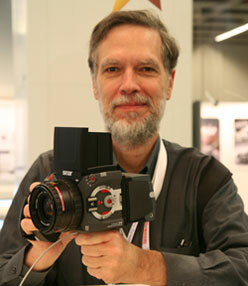 Rollei/Franke and Heidecke can learn from all the mistakes of the Hasselblad H1 camera (which definitely had issues). 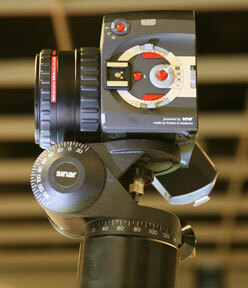 So the Sinar Hy6 and Leaf AFi can be a more advanced camera in every respect. 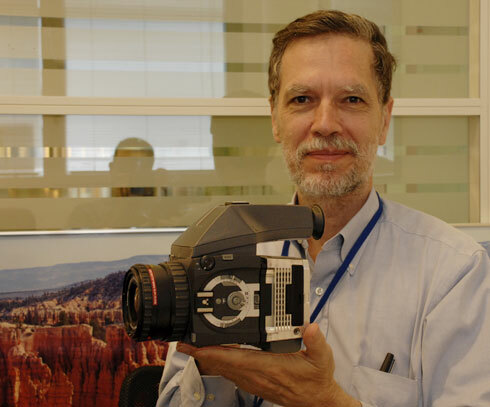 Hasselblad lacks the investment capital and R&D teams to make a completely new digital camera from the ground up. They are stuck with the Fuji body and Fuji lenses and whatever software was inherited from Imacon (this is why Phase One is the industry leader: Phase One offers Capture One software, considered by far the best of any brand for a medium format back). PMA 2008 and Photokina 2008 will be where we will next see the Sinar Hy6. Here is Nicholas Hellmuth at his recently LEAF factory visit in Israel. First posted Nov 19, 2007 .